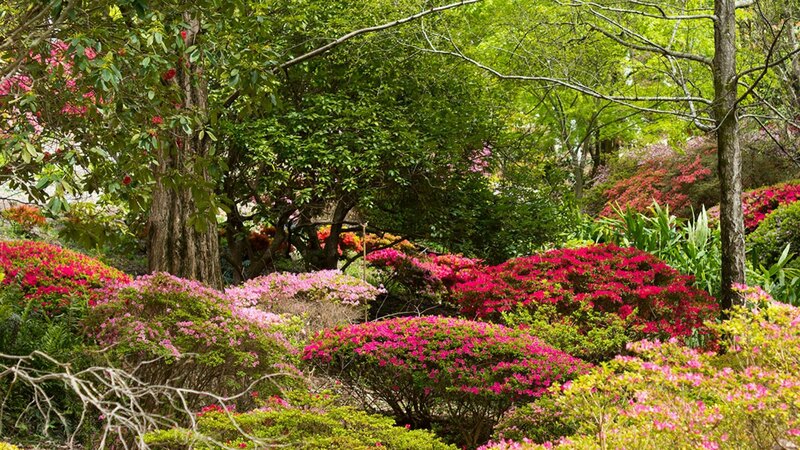 Mount Lofty Botanic Garden in Crafers is stunning in early spring with this cool climate Eden just perfect for the Magnolias, Camellias and Rhododendrons currently thriving within the garden that sprawls over 97 hectares. There’s so much to see within the botanic garden year round, with Magnolia Gully, Rhododendron Gully and South East Asian Gully (where Camellias are the star of the show) at their most impressive now. See the Botanic Gardens of SA website for the lowdown on 'What's Beautiful Now?' and visitor information. Some of the Adelaide Hills' best loved gardens welcome the public on special open day events - here's a sample of spring events and for more inspiration visit Open Gardens SA. Al Ru Farm at One Tree Hill in the northern Adelaide Hills is awash with colour and perpetually romantic with wisteria and rose arches cascading their way to the ‘white garden’ - an idyllic wedding backdrop. Crabapple blossoms fill the air in late spring, bursting into flower in the sun and accumulating on trees like spun sugar. During the October long weekend (Sunday 1 and Monday 2 October) Al Ru Farm hosts a highly anticipated event - an Open Garden and Plant Fair as part of Open Gardens SA spring season. The garden comes alive with striking pink silene, electric lime green euphorbia, bluebells, honesty, campanulas and Dutch iris, all thanks to the careful selection of Ruth Irving, who has created outdoor rooms of wonderment. Her creations are filled with exotic and native varieties, along with European structures and sculptures for a touch of Mediterranean magic. If it's Camellias you love, look no further than the beautiful garden surrounding historic Stangate House, a National Trust of SA heritage property in Aldgate. Spring is the perfect time to visit the ‘International Camellia Garden of Excellence’ that attracts flora loving visitors from far and wide. Enjoy the impeccably landscaped gardens and learn some of the history behind the placement of significant trees and flowers. The Camellia Society Adelaide Hills hosts Open Days every Sunday in September so head along for plant sales and Camellia advice. At Tickletank's Open Garden event in Mount Barker on October 14 and 15 you’ll find a lovely mix of cottage perennials and Australian Natives, merged with local artist Irene Pearce’s mosaic sculpture centrepieces. Feel like a magnificent bird, perched upon one of her colourful benches made from recycled materials that create a vivid continuity between living plants and static artworks. Also in Mount Barker, explore the garden of well-known garden columnist, author and TV presenter Sophie Thomson at Hamlyn Cottage. The garden is open to the public at various times throughout the year (spring dates are 18-20 November) and large group tours can be made by prior arrangement. Sophie is establishing her own sustainable organic garden including a large vegetable patch and a climate compatible ornamental garden. 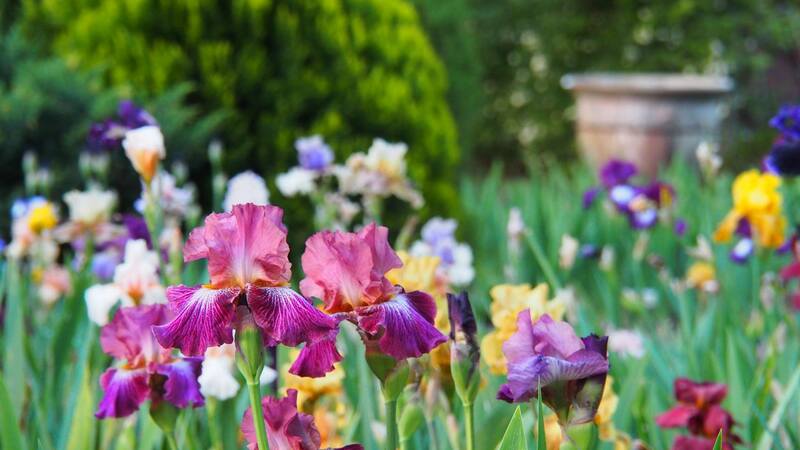 Ashgrove Iris Garden in Gumeracha is a garden of about one acre in the northern Adelaide Hills boasting a stunning mass planting of Bearded Iris in every colour imaginable providing a kaleidoscope of spring colour and perfume, as well as roses and a varied mix of native and exotic plants. Be inspired by their Facebook page and head along to their Open Garden event 28 and 29 October. Head to Wairoa in Aldgate on 4 and 5 November to experience a very important historic garden which is one of the last remaining examples of the Victorian style estates built as summer residences in the Hills for members of the South Australian gentry. Many of the original trees, now 125 years old, remain; including huge conifers, giant sequoias, a horse chestnut, a dawn redwood and oaks. Mature rhododendrons, camellias, magnolias, lilacs, philadelphus, and viburnums are underplanted with masses of Solomon’s seal, lily of the valley, forget me nots and anchusa in a glorious late spring display. Located about 10 minutes from Hahndorf, the Jurlique Flower and Herb Farm is best visited in late spring and early summer when the Jurlique team is harvesting sweet violets, daisy and heartsease. As the season warms, calendula, roses, chamomile, black elderberry, yarrow and lavender take centre stage. Jurlique farm is a treat for the senses as floral notes fill the air and intertwine with peppermint, birch, lemon balm, sweet violet, nettle and ivy. Beautiful and relaxing any time of year but especially in spring, the organic and biodynamic farm is well worth a visit. Take a tour to experience the garden and learn about the growth and harvest of these beautiful plants and herbs that have helped make Jurlique one of the most recognised skincare brands in the world. SA Spring Garden Festival, Mount Pleasant Farmers Market, Saturday 23 September - Explore a range of stalls featuring quality plants, garden furniture, decor and garden care products. Meet guest speakers and uncover the secrets to a successful garden! Spring Wine and Wildflower Walk, Sinclair Gully Winery in Norton Summit, Sunday 22 October - Pull on your boots and head to the bushland bar for a wine tasting in an endangered candlebark forest. Enjoy fine wine while you wander through a spectacular display of wildflowers. Check their Facebook page and website for event details. 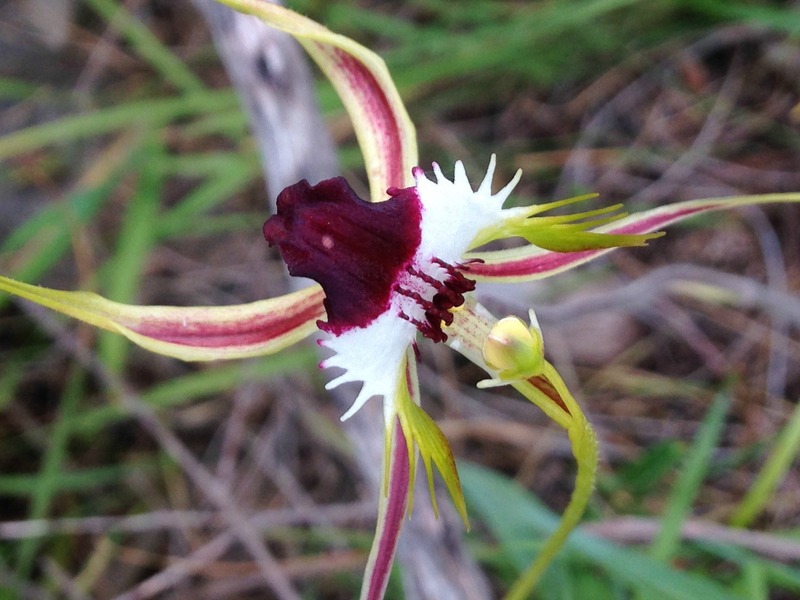 Parks across the Adelaide Hills have beautiful wildflowers in spring, including Morialta Conservation Park just 10 kilometres from Adelaide city where you'll find native orchids. Consider taking a guided tour with pureSA, a nature-based specialist tour operator with a couple of bushwalking tours in Morialta. Follow the trails with your guide as you discover an abundance of native flora and fauna set among amazing rock faces, gorges and seasonal waterfalls. As the trail comes to an end, the experience continues at the eco-certified Sinclair’s Gully winery where a private vineyard tour and native barbecue lunch awaits. Want to get hands on? Why not try a flower arranging class at the breathtaking Kidman Flower Co. native flower garden in Balhannah. Be inspired by the stunning surrounds and create a floral arrangement of your own (bookings essential) or call ahead to visit for shed door sales (alternatively pick up a bunch at the monthly Stirling Market). 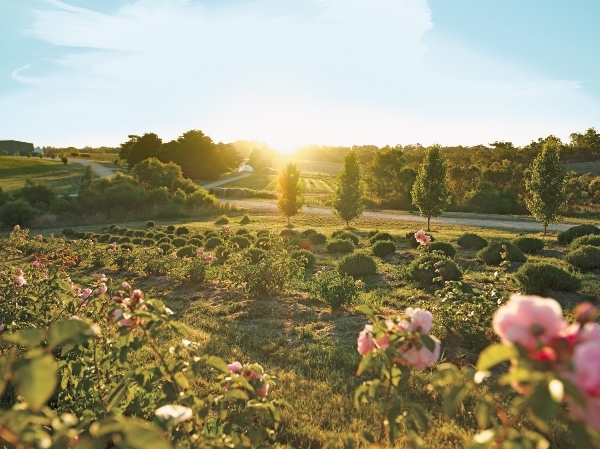 Let a local expert guide you on a tour of the Adelaide Hills and discover unique treasures and tranquil gardens. 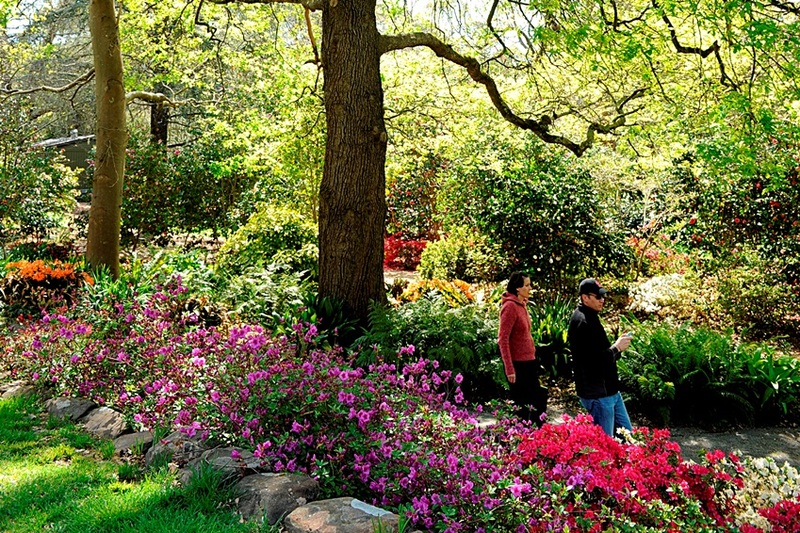 Join Greenbanks Tours to discover Mount Lofty Botanic Garden, the garden of revered landscape artist Sir Hans Heysen at The Cedars, Kidman Flower Co. native flower garden, and some Australian bush 'garden' for good measure. Keen gardeners will find it hard to resist a stop at one of the excellent plant nurseries and garden centres in the Adelaide Hills - our favourites include the State Flora Nursery at Belair National Park, Cleveland Nursery in Stirling, Crafers Garden Centre in Crafers, Tupelo Grove in Mylor, The Garden Depot (complete with little playground) and Misty Creek in Mount Barker, and Newman's Nursery at Tea Tree Gully with the Topiary Cafe and stunning wisteria arbour. All the rain we’ve had over winter makes our national parks and gardens all the more beautiful, vibrant and healthy so as the weather warms up take the opportunity to experience some of South Australia’s most impressive floral attractions. For more garden inspiration visit our Gardens page.